I have been a Little Free Library Steward in Marin County for two years. My husband built a Little Free Library (LFL) in the shape of a bright yellow Pac woman. Located in front of our home in Terra Linda, there is a shelf filled with adult and children’s books. The neighborhood kids trade books back and forth. I never know what books will be the most popular ones and I am constantly surprised by what great books show up in the Pac woman. The Little Free Library movement started in 2009 in Wisconsin. Todd Bol of Hudson, Wisconsin built a model of a one room school house as a tribute to his Mother. He filled it with books and everyone loved it. He built several and gave them away. Each one had a sign that said FREE BOOKS! Rick Brooks of UW, Madison saw this and discussed how this could be a project for furthering goals for common good. By the summer of 2010, the mission of Little Free Library became clear. While each little free library could have a unique look, all share the theme of sharing books and bringing neighbors together. This is my Pac Woman box and I love visitors. 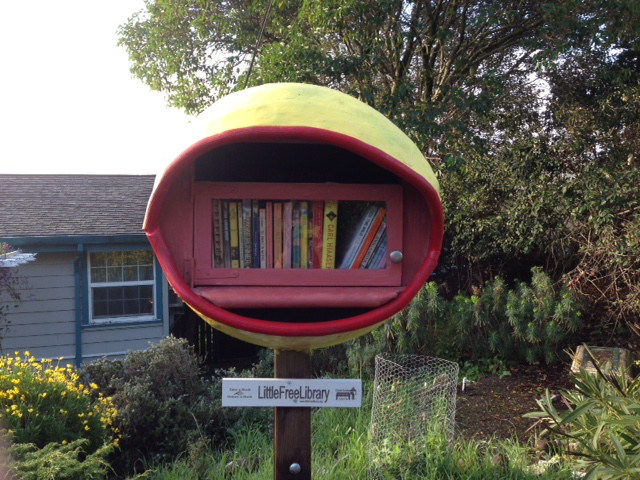 If you own or know of other Little Free Libraries in Marin County, please contact me so I can update my list. If you have questions about real estate here in Marin County, I am happy to help with your real estate needs!